I took my very first boxing class in college as a way to get that last credit to graduate. I had no idea that that one class would change me forever. As one of four girls in a class of fifty, I didn’t exactly blend in. But our instructors treated us all the same. The hour-long class was composed of six intense stations including; hitting the heavy bag, spring, shadow boxing, jump rope, push-ups and sit-ups. I had never pushed myself like that before. Nor had I felt such a rush of adrenaline! 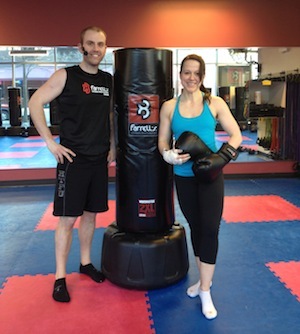 Flash-forward to today, I now have ten years of experience teaching boxing and kickboxing. 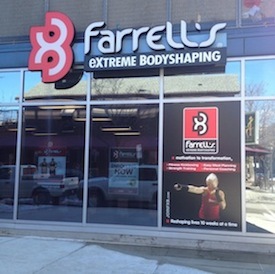 So when I heard about Farrell’s Extreme Bodyshaping Chicago, I knew I had to try out their boxing program! Ready to rumble, I came prepared with my own gloves and wraps. But when I arrived, I was shocked to see they were waiting for me with my own set of Farrell’s boxing gloves! And boy did they fit like a glove! Farrell’s Business Manager Brandon brought the intensity-very much like that of my old college class. After a solid warm-up and stretch, we began throwing a few front and back kicks, and shadow-boxing, (practicing our non-contact strikes with a mirror to watch form). Soon after, we rolled out the free-standing heavy bags and went to town on our jabs and crosses. What I really liked about this heavy bag work was that it was extremely fast-paced and Brandon never let us stop. Segments included things like a basic jab, cross and then a push-up. Then we’d add on a hook, jump squat, dips, an extra push-up or a burpee. This class was extremely vigorous and worked my entire body! The complete program consists of six scheduled workouts per week for ten weeks. This is composed of three cardiovascular workouts and three strength training sessions each week. Because of this schedule, this program is hugely successful at helping participants who are looking to lose weight. My instructor for the day? He’s lost over 100 pounds on the program! But no matter what your specific fitness goals are, I highly recommend you give their workouts a shot! 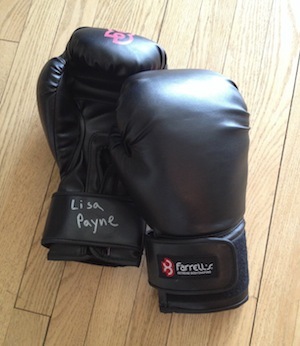 In fact, to help kickstart your kickboxing, use the promo code PAYNE at the online checkout and receive 30% off!